We’d love your help. Let us know what’s wrong with this preview of A History of Greek Philosophy, Volume 2 by W.K.C. Guthrie. To ask other readers questions about A History of Greek Philosophy, Volume 2, please sign up. So, what can I say about this history of greek philosophy? 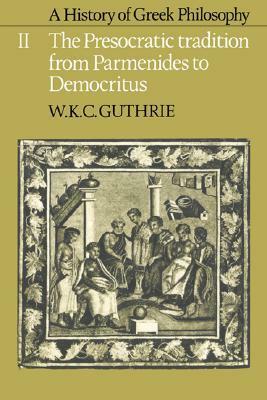 Only that I confirm my formen opinion: Guthrie is without any doubt a great scholar when it comes to ancient philosophy. Due to lack of (free) time I was forced to skipp several charapters, which is a shame, and hope to read as soon as possible together with other volumes of this work. 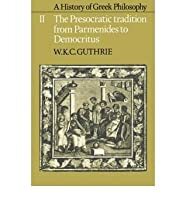 Beautifully written, detailed notes on crucial aspects of any texts and deep argumentation of each thinker, different interpretations of later philosophers So, what can I say about this history of greek philosophy? I read this for visiting professor Reginald Allen's course on Plato's Parmenides, taught at Loyola University Chicago during the first semester of 1981/82. For this class I wrote a paper on the fragments of Parmenides, concentrating on the Proem, which I tried to approach more from a religious than from a philosophical perspective, as something like a prayer.